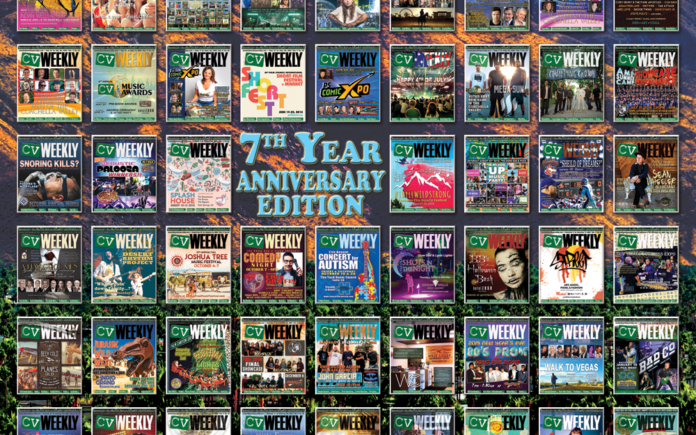 Seven years ago when I started CV Weekly I had no idea what the future would hold; I just knew that I had to follow my dream of starting my own publication. I made a decision and 3 weeks later CV Weekly came to fruition. It was not just my dream, but that of several writers that came on board with me from day one, wanting to bring a new publication to this valley. From day one our Mission Statement has been: Our goal at CV Weekly is to provide our readers with content that appeals to every age, race, gender, life style and income level. We will cover community events and newsworthy issues with a fresh perspective. We want to be the ONLY weekly paper that you want or need to pick up for music, movies, live theatre, dining, casinos, business, fashion, sports, mind, body & spirit, health, fitness & beauty, book reviews, politics and culture. From Palm Springs to Coachella and every city that lies between. We are here to serve the entire Coachella Valley as well as the hi-desert cities. WHO reads Coachella Valley Weekly? EVERYBODY does! I feel that we have accomplished that and we continue to strive to bring our reader’s quality content as well as our advertisers a publication that gets their message out there. I am extremely proud of my whole team and what we have accomplished together! I also want to thank our loyal readers and all of our advertisers that keep us in business EVERY WEEK. Without ALL of you we would not be able to continue week after week to deliver this paper to the valley. 7 Year Anniversary Party – Thursday, April 4 from 6-10pm @ Big Rock Pub. Come out and celebrate this milestone with the CV Weekly team. Free event and open to the public. Entertainment provided by: Lisa Lynn Morgan, Vinny Berry, Rick Shelley, Derek Jordan Gregg, Chelsea Sugarbritches/Linda Lemke Heinz & Martin Barrera and Lance Riebsomer. CV Music Showcase (last preliminary round) – Sunday, April 7 at 9:00 pm. Four bands will battle it out to win $200.00 and advance to the Finals. Bands competing are: Matt Claborn, Jetta King, Whyte Frydai and Nolan Lowlife. Free show. Saturday, May 4 – The CV Music Showcase Finals @ The Hood Bar & Pizza at 8:00pm. Bands that have already made it into the Finals are: Giselle Woo & The Night Owls, Ormus, Empty Seat, Derek Jordan Gregg, and the band who wins the preliminary round on April 7. There will also be a Wild Card pick from all the preliminary rounds. The winning band will receive $2,000 cash sponsored by The Hood Bar (1,000) and Julie Montante of PSA Organica (1,000) along with a studio recording time with David Williams at Melrose Recording Studio and a Photo Shoot with Steven Young Photography. $5.00 at the door. CV Music Awards Pre-Show – Thursday, May 30 @ Big Rock Pub- Several bands will perform TBA soon as well as many of the awards in the 44 categories will be given out. $10.00 at the door. 7th Annual CV Music Awards Main Show – Sunday, June 2 @ Hotel Zoso in PS from 5-9 pm with VIP party to follow at 9:15 to midnight. Check out our website at www.coachellavalleyweekly.com in the next couple days for the list of nominees so you can vote for your favorite bands and artists in 44 categories. We added 4 new categories this year: Latin Band/Artist, Best Singer-Songwriter, Best Radio Personality and Best Radio Station. This year we have the legendary Paul Rodgers (Bad Company, Free, The Firm) coming to accept the “ICON Award”. Accepting the “Pioneer Award” is Jimi “Fitz” Fitzgerald and we will also honor BB Ingle with the “Lifetime Achievement Award” for Promoter. A majority of the awards will be given out at this main event along with several bands performing including: Chelsea Sugarbritches & Lance Riebsomer, Provoked & James Dorris, The CMF’s, Ormus, Grady James, Empty Seat, Keisha D, Steven Rodgers, Desert Rhythm Project, The Sweat Act, Caxton, Giselle Woo & The Night Owls and Derek Jordan Gregg. There will also be a tribute to Paul Rodgers performed by nominees: Michael Keeth, Vinny Berry, Lisa Lynn Morgan (vocals), Tom Edwards (guitar), Nick Hales (guitar) and Jeff Bowman (drums). Tickets are $25.00 for main awards and $50.00 for VIP after party which includes a multi-restaurant buffet, hosted bar (beer, wine, all cocktails) and music by DJ Guy Worden. All those that purchase VIP tickets will receive a goody bag with Paul Rodgers CD and DVD. Ticket link coming soon. Thank you for supporting all of our events. Next articleThe ABC’s of CBD – Part2: What does CBD do?